I have been wanting to make one of these cards ever since I received the Detailed Floral Thinlits! Oh my goodness! This is a FAST card to make! 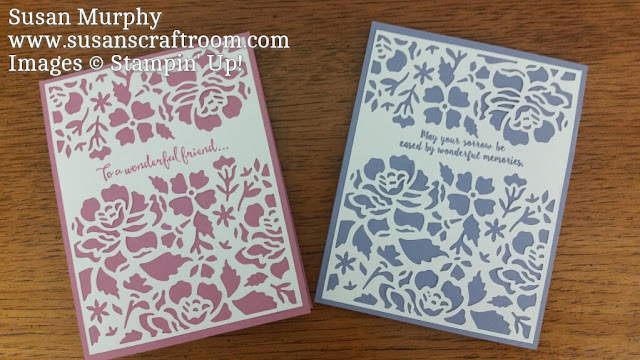 If you need a quick beautiful card, this is a great design! It comes together really fast! I made it in both Sweet Sugarplum and Wisteria Wonder. I can't decide which I like better! Post in the comments which color you like better. 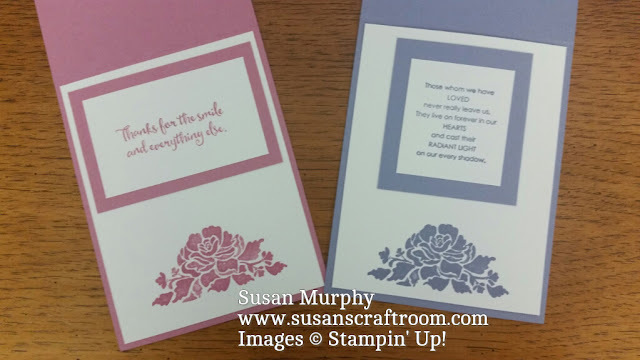 Although I chose sentiments from different stamp sets, the Detailed Floral Thinlits can be purchased as a bundle with the Floral Phrases stamp set and you save 10%. *The inside sentiment in the Wisteria Wonder Card is from a retired stamp set called Love & Sympathy. The Precision Base Plate for the Big Shot Die-Cutting Machine and the Die Brush are essential for using these intricate dies. All of the itty bitty pieces just pop right out! I like to use the Multipurpose Liquid Glue making cards. It gives me a little bit of "wiggle time" in case I have something crooked. If you have some glue that gets outside of a piece of cardstock it also cleans off easily with the Adhesive Remover. This little square is a necessity to have in your stampin' tools!